I was the lucky recipient of a sponsorship by Herman Miller Education and FLEXspace to attend the 2016 Designing Libraries Conference in Calgary, Canada! The conference focuses on designing and utilizing innovative learning spaces in libraries, so it’s right up my alley! 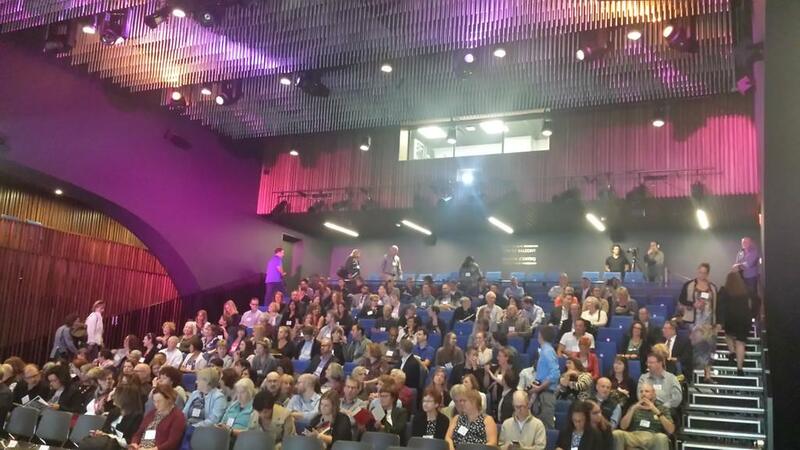 I kicked off the conference with a pre-conference session called Innovations in Teaching & Learning Spaces which focused on The University of Calgary’s beautiful Taylor Institute for Teaching and Learning. The session began with an explanation of the history of the building led by Lynn Taylor, the Vice Provost for Teaching and Learning at the University of Calgary. 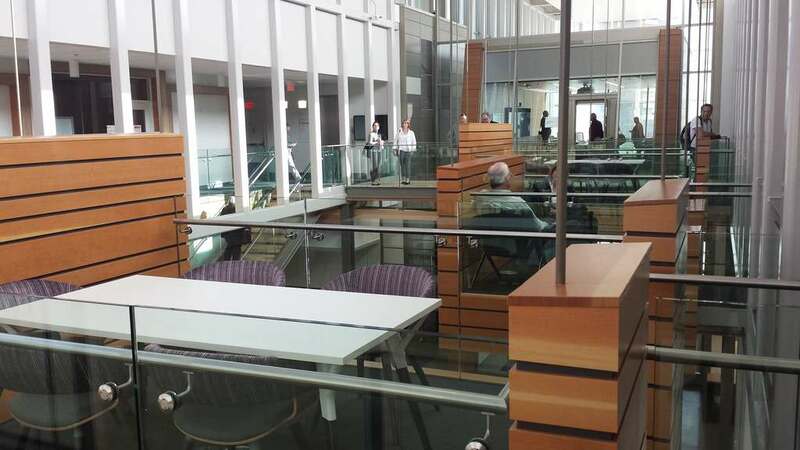 The space was designed as an “incubator” for teaching and learning ideas from across the campus. They built the space using the foundation of an art gallery and it still retains the spirit of creativity and discovery. In the initial stages, 50 stakeholders from the University brainstormed the concepts that gave the building form and they worked with an interdisciplinary team and an academic advisory team to solve problems through the building process. Their guiding principles for the building were flexibility, transparency, and collaboration. Their technology integration relies on an elaborate system of floor outlets that allows furniture to be moved around spaces quickly and easily. Next, we heard from Matthew Lella, the architect from Diamond Schmitt who worked with the University on the design of the Taylor Institute. Building a space that encourages flexibility, transparency, and collaboration has its challenges (always acoustics! ), but they also create a network of sensory experiences that augment and develop the course and created materials that accompany learning. 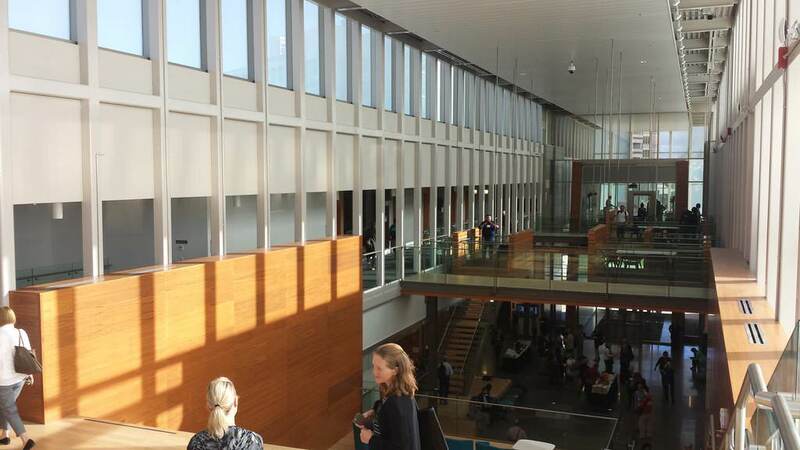 The design of the building took the idea of transparency to heart and the first design decision was to create huge glass boxes all across the ceiling of the building to incorporate a lot of natural light. We also heard from Timothy Waters, Principal Consultant at The Sextant Group who spoke about the methadology for integrating technology and pedagogy into the spaces. 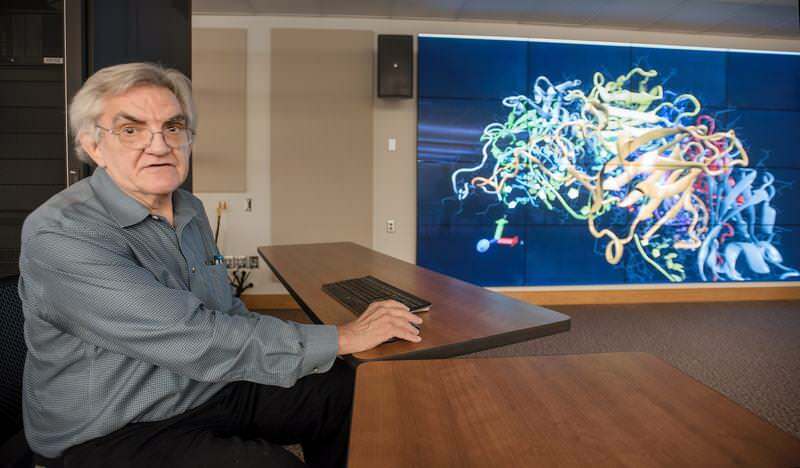 They made an effort to accommodate any software and hardware that students and faculty wanted to use, which led them towards more wireless connectivity. The second morning session featured Nancy Chick, Natasha Kenny, and Caitlin McClurg discussing how they program and share the vision of the Taylor Institute. They have a fund to help support “teaching scholars” that are doing innovative things with teaching and learning. They currently have 14 scholars across 9 disciplines working to collaborate with other instructors and lead teaching initiatives. They required each teaching scholar to create an engagement plan to work with campus departments and other instructors. The Taylor Institute staff also created a liaison position to integrate the Institute with the Library. The Taylor Institute was a beautiful example of architecture and technology working in harmony to create innovative, transparent learning spaces. 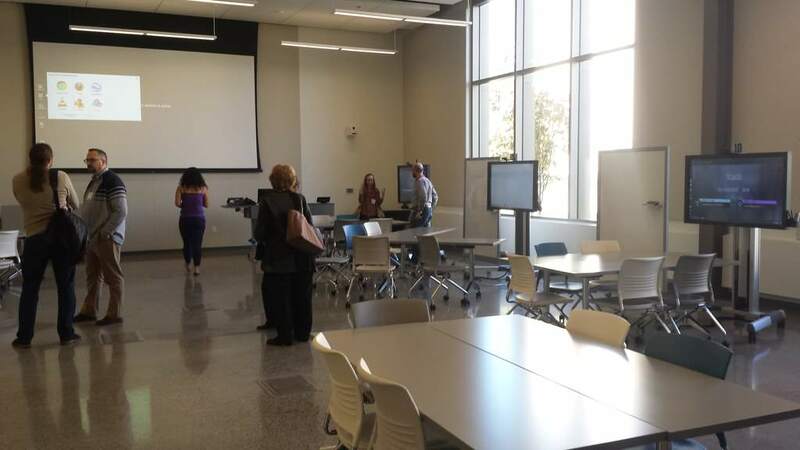 It was great to explore the space and hear about the engagement initiatives the University has prioritized with teaching faculty and the library. The afternoon session of the pre-conference was a session of short presentations featuring Joan Lippincott, Associate Executive Director of the Coalition for Networked Information speaking about cross overs between increasingly collaborative library spaces and other spaces on campus. After that, John Danneker, Director of the University of Washington Libraries explained his library’s trajectory from its construction in the 1970s to a contemporary undergraduate library. The population and challenges at Washington are very similar to those at Stony Brook (down to our signature staircases and very tight renovation timelines!) One of the things they did in their renovation is glass in their third floor to create quiet spaces in their very open floor plan. 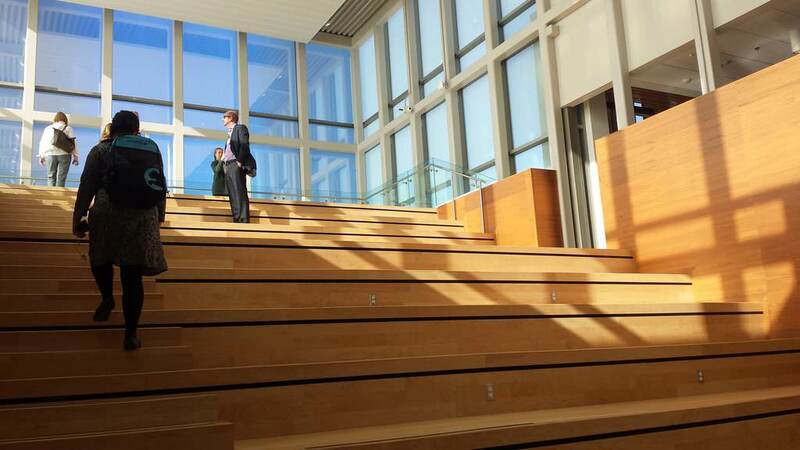 After the pre-conference sessions, there was an opening reception and tour of the Taylor Family Digital Library, the new library on campus at the University of Calgary. 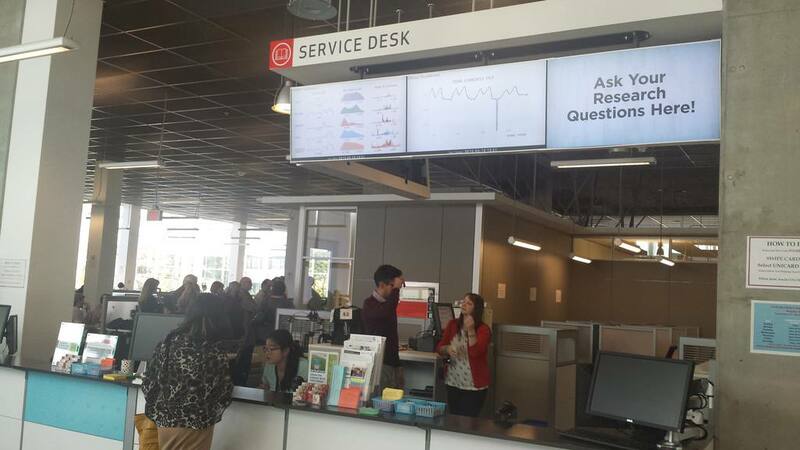 They had a fantastic service desk with screens showing realtime circulation and use statistics styled as a library scoreboard. They also had beautiful, light-filled cafe-style spaces that were all filled with students, even on a Sunday! We spent the evening at the National Music Centre which featured dramatic, canyon-like walls covered in a subtly reflective terra cotta tile. The acoustic solutions they developed to host music events in harmony with such a hard surface material, including separating the tiles slightly in key areas to allow sound to be absorbed around them, were very inspirational. 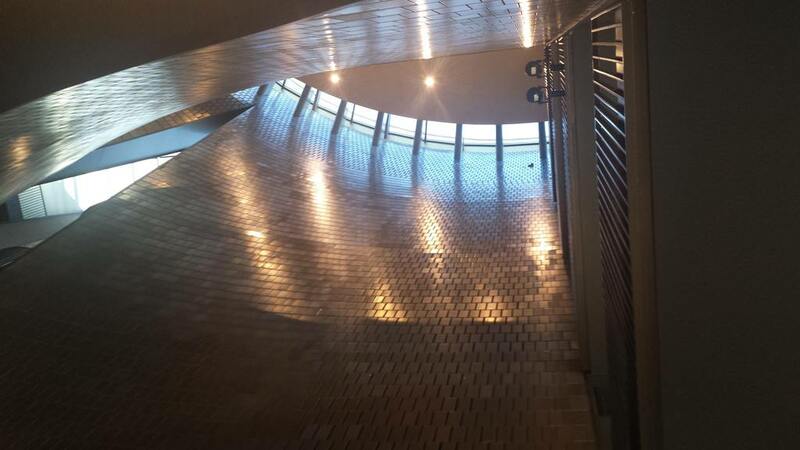 The Centre features a wonderful collection of instruments and Canadian music museum, so it was great to explore. 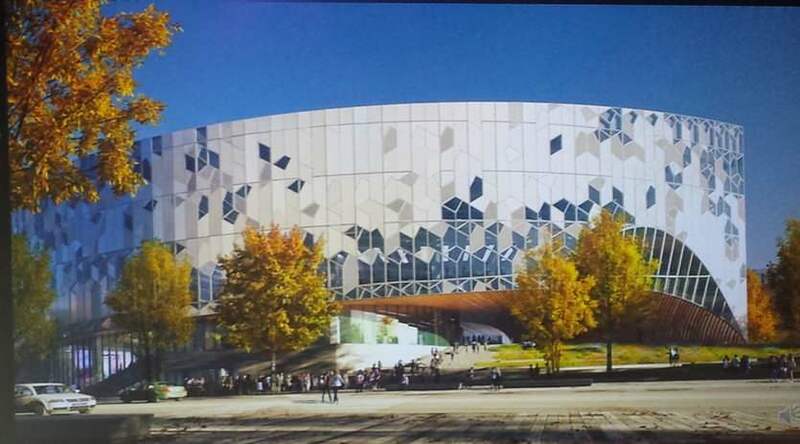 We also heard from Bill Ptacek, CEO of Calgary Public Library and Vanessa Kassabian from the architecture firm Snøhetta, who are working together on the new construction of the central branch of the Calgary Public Library, which is being built in downtown Calgary, right behind the National Music Centre. 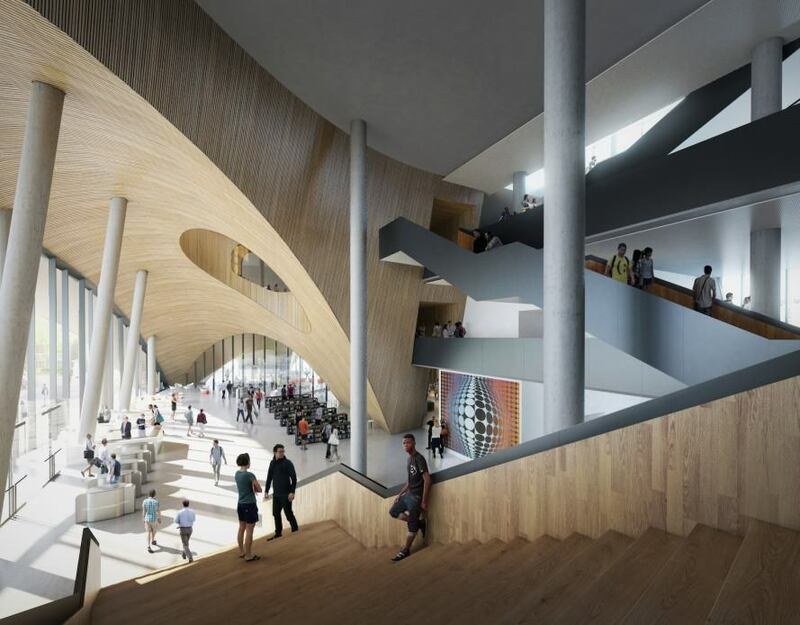 They dealt with many challenges in the design, including that the light rail trains emerge from the center of the building and were only shut down for two weekends during construction, but the design is gorgeous and the finished building is going to be a treasure in Calgary. Joan Lippincott kicked off the second day of the conference with a talk on the importance of creating spaces in libraries that feel like they belong to students and integrating art and culture into designs. The next two hours featured a massive panel moderated by Claudette Cloutier, Associate University Librarian at the University of Calgary and featuring architects and librarians highlighting their new spaces. The first speaker was Nathan McRae, Senior Architect at Snøhetta, who discussed his firm’s work with libraries from the Library of Alexandria to the Temple University Libraries. Joe Lucia, the Dean of Temple University Libraries, was also present on the panel and it was great to see their collaboration in action. Then we heard from John Ulmschneider, University Librarian at Virginia Commonwealth University Library. 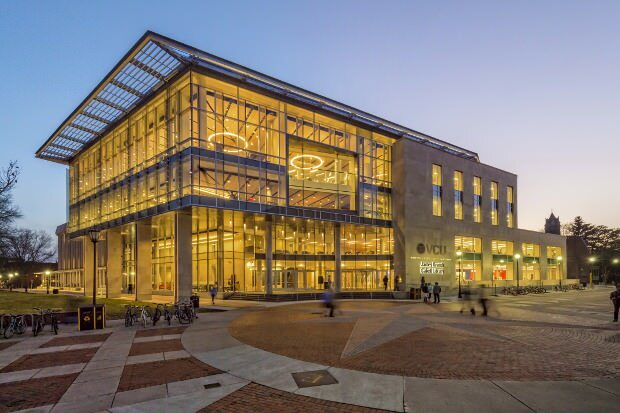 VCU worked with Shepley Bulfinch to transform their outdated building and conceptualize the idea of their library as a center of the University Community. Ulmschneider explained his evidence-based approach to fundraising. VCU also put together a great fundraising website for their continuing construction. Kelly Brubaker, the architect from Shepley Bulfinch who worked on the VCU project, also spoke about the design and considerations of the project. One of the themes that has emerged through the panel is the concept of the library as a “learning beacon” for students, with a large, central profile on campus, and transparent walls that lights student work with the sun by day and draws students with internal light by night. VCU took this idea one step further by adding a GKD MediaMesh on the outside of the building. They developed a policy and promotions page for this “vitrine” which is made of a steel and LED mesh and displays short exhibitions of promotions and artwork related to campus. The last panelist was William Mischo, Head of the Grainger Engineering Library Information Center at the University of Illinois at Urbana-Champaign. His approach was particularly interesting to me because, like Stony Brook’s, his library was not rebuilt, but represented a renovation of an existing building. After lunch, there was a panel on virtual reality and visualization. The first speaker was David Woodbury, the Associate Head of User Experience at the North Carolina State University Libraries. The library has taken the lead in sponsoring equipment for virtual reality programs initiated by their departments. For instance, they have a fire ecology program that has developed a virtual reality controlled burn so students can “experience” this isolated event at any time and safely on campus. 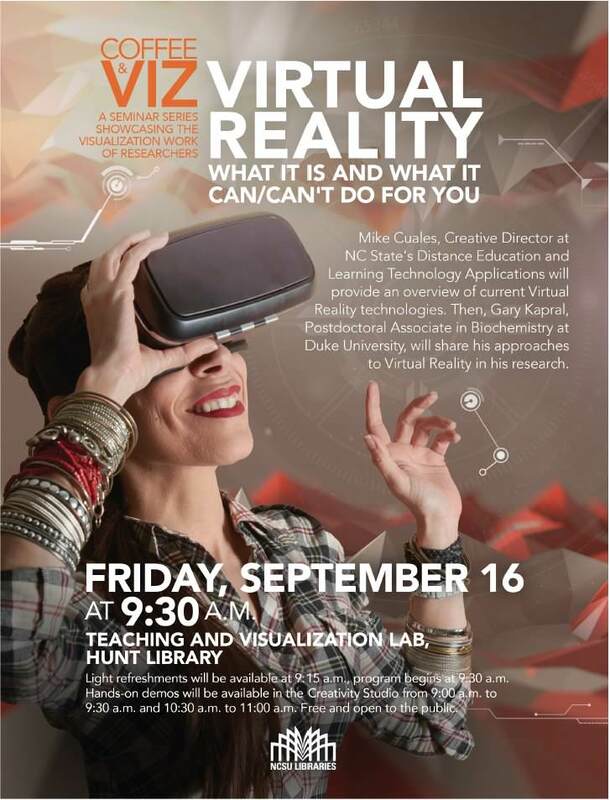 They have also planned programming around the tools including a “coffee and viz” event for faculty. 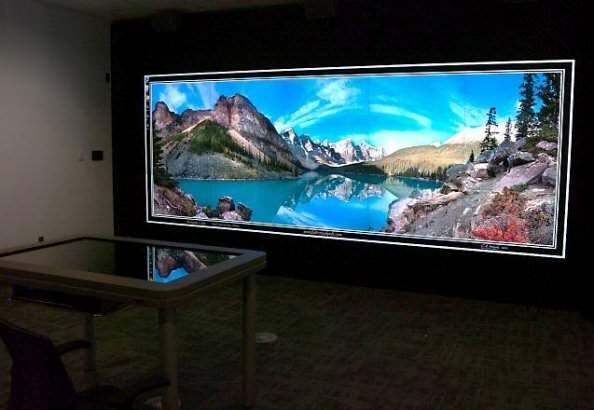 The next speaker was Renee Reaume from University of Calgary, who discussed her strategy for developing the large format digital displays that are integrated into the library spaces across campus. We also heard from Sheelagh Carpendale, a professor of Computer Science at the University of Calgary, who gave an outsider perspective on designing libraries which was very interesting. She talked through a few studies that have come out of her lab including one about large displays which showed that size doesn’t really matter as much as resolution. The second afternoon session was on makerspaces in libraries and featured Adam Rogers, Emerging Technology Services Librarian at North Carolina State University Libraries. NCSU has two makerspaces which serve everyone on campus with a mission of technology literacy. One of the coolest things they have done at NCSU is hack a card entry system for their makerspaces. They’re doing very exciting things! Next we heard from Peter Schoenberg, Digital Literacy & Web Services Librarian at Edmonton Public Library. EPL worked with a community architectural and design group called MADE to design the space, which opened in 2013 with an invite-only event that brought social media trendsetters from across the city to enjoy and promote the space. Since then they have had thousands of 3D prints, sound booth bookings, and gaming sessions with visitors and community members. The last session of the second day was about innovations in architecture and featured Vanessa Kassabian from Snøhetta and Jay Verspyck from Shepley Bulfinch. The third day opened with a plenary session by Tom Hickerson, Vice-Provost of Libraries and Cultural Resources at the University of Calgary. His talk brought our experience at the University of Calgary together by explaining the research and cultural forces that shaped the library facilities across the University. The next session focused on digital scholarship centers. The first speaker was Dale Askey from McMaster University Library who spoke about his University’s Lewis & Ruth Sherman Centre for Digital Scholarship, which sponsors graduate research fellows working on digital scholarship projects. Next up was Eric D. Johnson Head of Innovative Media at Virginia Commonwealth University Libraries, VCU’s digital scholarship center is focused on undergraduate work and helps students express themselves in non-text ways. They have a ton of awesome equipment for making, gaming, and media production. One of the keys to VCU’s process is keeping in touch with the needs of their constituents and being flexible enough to grow and expand their offerings to support all the things they want to do. The third speaker was Liz Milewicz, Head of Digital Scholarship Services at Duke University Libraries. 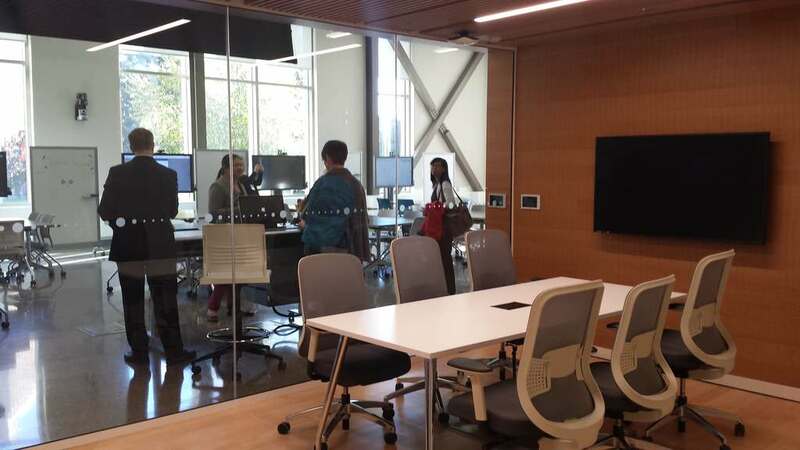 Duke’s digital scholarship center is called The Edge and filled a need on campus for space and just-in-time technology that teams could use to work on digital academic projects for extended sessions. 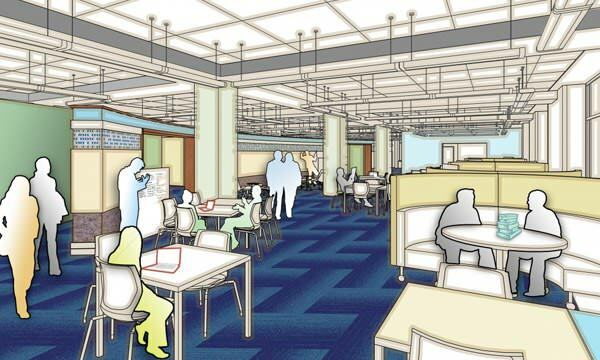 Duke uses LibCal software and a proposal process to manage their space, but still allow interdisciplinary, extended projects to find reliable space on campus. The last session of the conference was a panel on the organizational impacts of space redesign moderated by Joan Lippincott and featuring Leonora Crema, Scholarly Communications Librarian at the University of British Columbia Library; Mary Ann Mavrinac, Dean of the River Campus Libraries at the University of Rochester; and Catherine Murray-Rust, Dean of Libraries at Georgia Tech. The University of Rochester had a particularly interesting organizational challenge when they changed their service model to a unified model across all libraries. 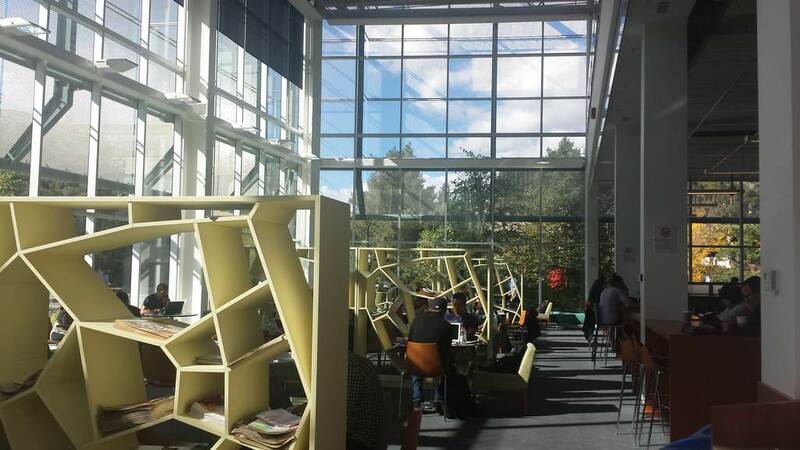 They had a small renovation to one of their areas and had to promote an organizational change across existing and new spaces that allowed librarians to work from any service point and to work beyond service points to help students across library spaces. 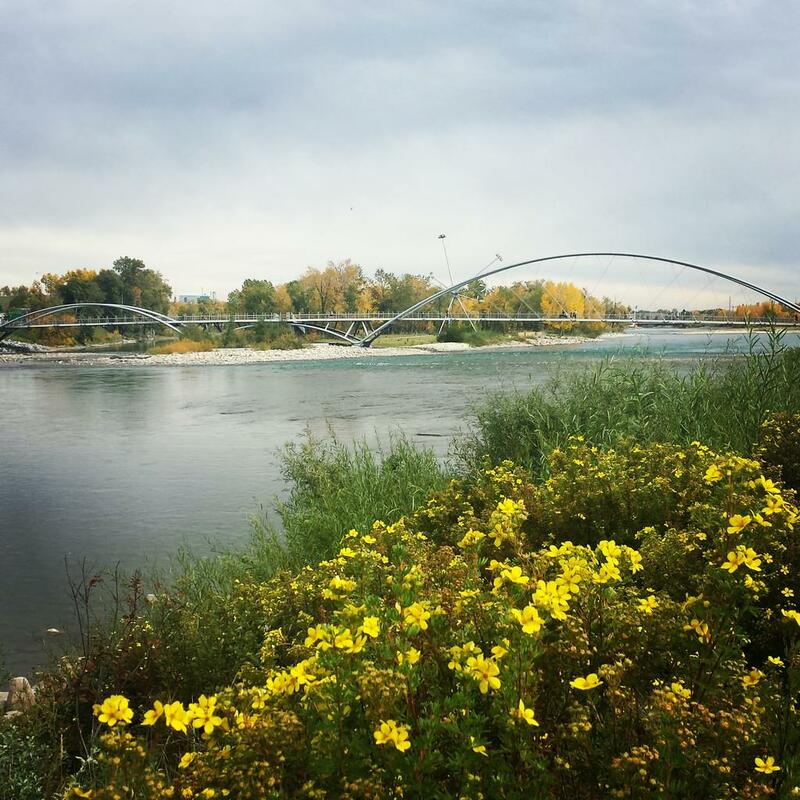 Calgary was gorgeous, crisp, clean, and friendly! On my last day there, the train I was taking to the conference apparently derailed an hour before I was on my way, but I didn’t even know until after I had arrived seamlessly at my destination. That kind of thing would have messed up the LIRR for hours if not days! I’m very impressed, Canada. I had a great time at the conference too. There were about 250 attendees and every single one I met was working on something interesting. It was a great journey and learning experience. 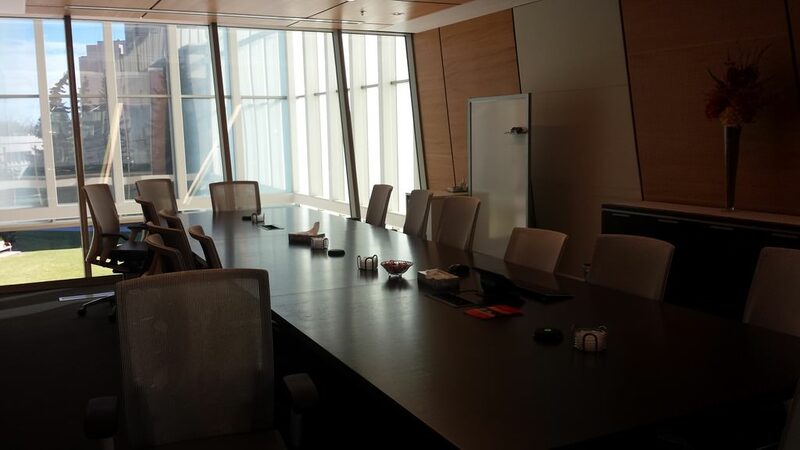 Thanks again to the folks at Herman Miller and FLEXspace for giving me the opportunity to attend! This entry was posted in Event, Library, Travel. Bookmark the permalink.